There’s nothing worse than missing that perfect shot because a fiddly fastening refuses to open or because your camera is at the bottom of your backpack. Ensure that your camera stays in one piece wherever you go, and you don’t miss the chance of capturing the best images possible with our range of Canon camera bags. Whether you’re a professional or just starting out, make sure your camera is easy to access whenever you need it with a zip fastening Canon camera bag. Our range includes backpacks, shoulder bags and even water-repellent bags so you can protect your gear whatever the weather throws your way. 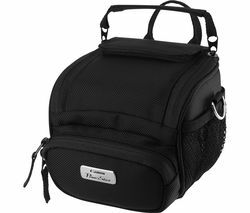 Available in a variety of styles and sizes, our range of Canon camera bags also offers lightweight options with all-important storage compartments for additional lenses and memory cards. If you take your photography seriously, you’ll want a bag from a manufacturer that understands your needs, and Canon does exactly that. All Canon camera bags are made from tough protective materials, so you can transport your camera with peace of mind. Canon has even considered your comfort in its high-quality designs, so you’ll find styles with padded shoulder straps, so you can carry all the equipment you want without any worries. Looking to upgrade your camera? Check out our extensive camera collection for DSLR, compact system, bridge and compact digital cameras. Make sure you also take a look at our range of Lowepro camera bags once you’ve made your choice!